Editor’s note from Brian: I hope that you can use this whether you are a head coach receiving feedback from your administrator, an assistant receiving feedback from your head coach, or to help players as you coach them. So what advice can we give? 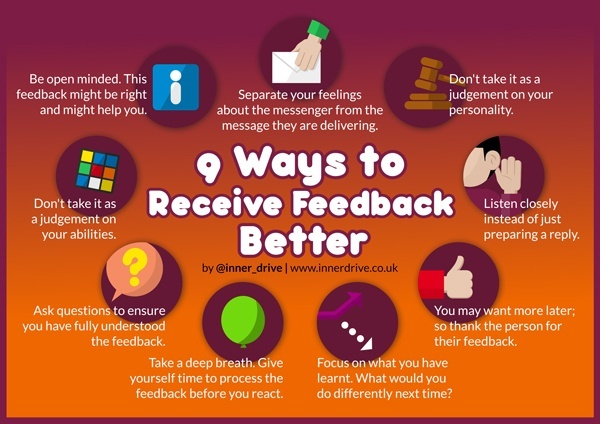 How can we help people learn to receive feedback better? Be Open Minded – The feedback you are being given might be right and might help you. Countless learning opportunities are lost by people entering the situation with a very fixed and closed mind. Being open to possibilities and difference of opinions is a good launch pad for learning. Distinguish Between The Message and The Messenger – It is important to separate your feelings about who is giving you the feedback from the message that they are actually delivering. Just because you like someone doesn’t mean their feedback is helpful. Likewise, just because you dislike them doesn’t mean the feedback is redundant. Focus on the point, not the person. It is Not a Judgement – The feedback you are being given is not a judgement on your personality or on your future ability. See it for what it is, which is advice on how to get a bit better. This is one of the cornerstones that growth mindset theory is built on. Once you start to see feedback on a task as a judgement on our self-identity, it can lead to rejecting the feedback and lead to a fear of failure. Listen Closely – There is a titanic difference between listening intently and being silent whilst preparing a reply. By focusing more on your reply, you are disregarding some of the feedback. If you have asked someone for feedback, and if they have taken the time to offer you advice, you should maximise your time with them by listening carefully. Check For Understanding – The person giving you the feedback may think they have been very clear on what they have said. You may be pretty sure you have understood them. However, it is easy for misunderstanding and miscommunication to occur. Asking them one or two questions to check for understanding may take 1 minute longer, but can save you much more time in the long run. Take a Deep Breath – This gives yourself time to process the feedback before reacting. This can really help, especially if things are tense or you feel under pressure. Chances are, your emotional response is unlikely to the best one and you don’t want to make a permanent decision off a temporary feeling. Focus on What You Have Learnt – Feedback that doesn’t result in anything changing is as effective as not having received any feedback at all. Asking yourself ‘what would I do differently next time?’ is a great way to ensure you have learnt something. Say Thank You – Even if you don’t agree with the feedback on this occasion, you may want more later. And it’s just good manners.